GRILL DIRECTIONS: Heat grill. In medium bowl, combine ground turkey, bread crumbs, chili powder and garlic salt; mix well. Shape mixture into four 5-inch patties. When ready to grill, oil grill rack. Place patties on gas grill over medium-high heat or on charcoal grill 4 to 6 inches from medium-high coals. Cook 10 to 15 minutes or until no longer pink in center, turning once. Meanwhile, in blender container, combine mayonnaise, avocado, lemon juice and garlic powder. Cover; blend until smooth. To serve, spread bottom halves of buns with mayonnaise mixture. Top with turkey burgers, tomato slices and sprouts. Cover with top halves of buns. To broil turkey patties, place on broiler pan; broil 4 to 6 inches from heat using times above as a guide, turning once. Ground chicken or lean ground beef can be substituted for the ground turkey in the burgers. 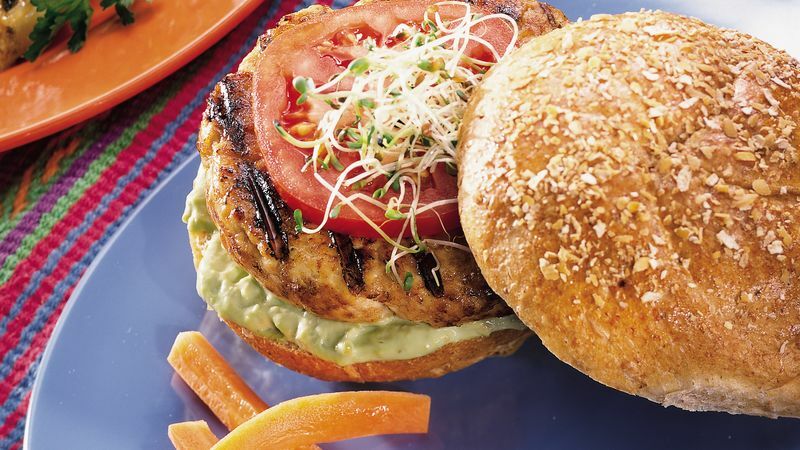 Shredded lettuce can be substituted for the alfalfa sprouts on these burgers. Prepare the patties up to 8 hours in advance; cover them with plastic wrap and refrigerate. Blend the avocado mayonnaise ahead as well; cover and refrigerate.